ITER Newsline Keep in touch with ITER through our main news feed, sent weekly. ITER Magazine - French Learn more about the ITER Project by subscribing to this quarterly online magazine that is geared toward the general public. ITER Open Doors Day - Notifications Stay informed about the ITER Open Doors sessions and be among the first to subscribe to the next event. Who is participating in ITER? One million components, ten million parts — find out more about the ITER Tokamak and its systems. Bringing a star to Earth? Explore the science of ITER. Follow the construction of the world's largest tokamak in southern France. The latest photos, videos and publications from the ITER Organization. Plasma webcam among world's "most interesting"
During the week of 6 October, the 12th Conductor Meeting took place in Kokura, Japan near the Wakamatsu ITER factory, where jacketing activities for ITER's toroidal field conductors and central solenoid conductors have been underway since 2010. The Conductor Meeting is held semi-annually to reunite the actors involved in the procurement of conductors—from the ITER Organization, the six producing Domestic Agencies, and industrial manufacturers—for a review of progress. Over 95 percent of toroidal field superconducting strand lengths and approximately 75 percent of toroidal field conductor unit lengths have been fabricated. As the procurement of toroidal field conductors nears completion, the focus of magnet activities is shifting to the next phase: the fabrication of 19 toroidal field coils (18 plus one spare). Three toroidal field conductors have been wound and heat treated in Japan and Europe. Progress was also reported on central solenoid conductor procurement. Five central solenoid conductor unit lengths (approximately 10 percent of total needs) were fabricated and transferred from Japan to the USA in June 2014. These conductors will be wound for the lower module of the central solenoid coil stack (CS3L) in California. Strand and conductor production for the poloidal field coils is also steadily advancing, with 18 unit lengths of poloidal field conductor manufactured to date. Arnaud Devred, head of ITER's Superconductor Systems & Auxiliaries Section, looks back with satisfaction on seven years of collaboration on magnets. "We have come a long way since the signature of the first magnet Procurement Arrangement with Japan (for the toroidal field conductor) in November 2007. As of today, more than 140 conductor unit lengths have been completed by China, Europe, Japan, Korea, Russia and the United States and the ITER Organization has cleared approximately 9,700 control points through the web-based ITER conductor database." 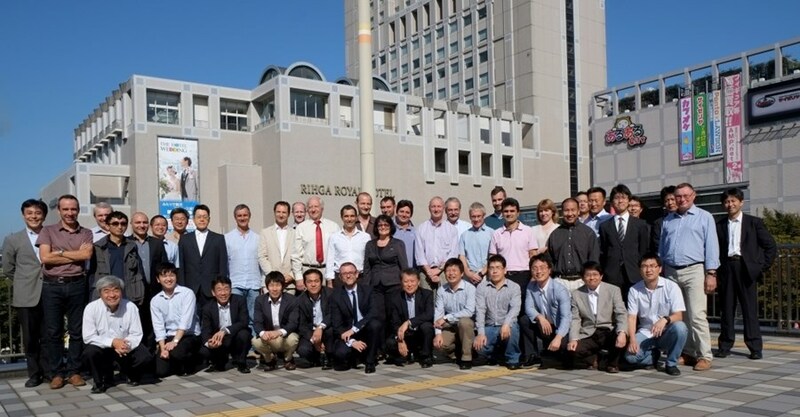 "In spite of extraordinary tough project constraints, the ITER Organization and Domestic Agency responsible officers have been able to build a strong collaborative spirit and a good mutual understanding of the technical and quality assurance/quality control requirements that have been instrumental in overcoming difficulties and ensuring progress. The Conductor Meeting has been an important and effective forum for exchanging information"
The next Conductor Meeting will take place in March 2015 at the CRPP fusion institute in Switzerland with the participation of the SULTAN working group for ITER conductor tests. A final conductor meeting is foreseen in September 2015 at the ITER Organization.